Meet the 4 students from Mount Carmel High School that topped Grad class 2018! Posted: Saturday, June 2, 2018. 1:57 pm CST. By BBN Staff: The La Loma Luz Hospital in Santa Elena town will be hosting a community health fair on Thursday, June 7. Hope Missions 360, a volunteer mission organization from the United States will be conducting free dental cleaning and extraction. 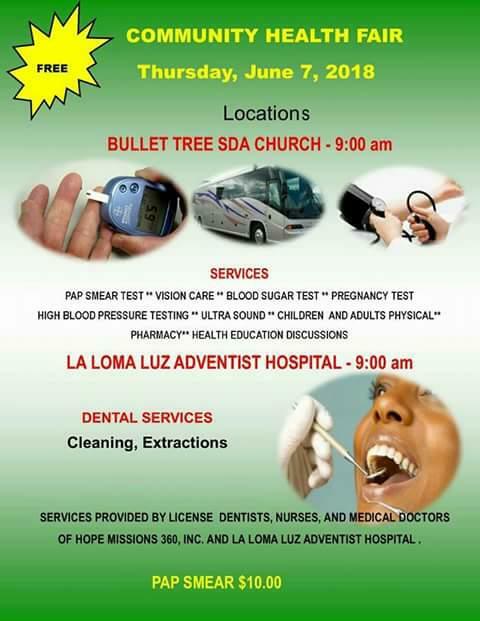 The free dental sessions will be conducted simultaneously at La Loma Luz Adventist Hospital and at the Bullet Tree Seventh Day Adventist Church on Thursday at 9:00 a.m.
An obstetrician from the mission group will also conduct consultations and pap smears for only $10. Free ultrasound services will also be offered. A physical therapist will also be available for consultations. Persons wishing to attend can call the receptionist at La Loma Luz at 824-2050. The public is advised to take advantage of this great opportunity.